The inaugural year of the North Central Women’s League has been a busy one, and CEO Marianne Friedman says the nonprofit group is planning to be even busier in year two. The group started with 37 members who volunteered more than 650 hours of community service and donated money and supplies to community partners, including Amanda Hope Rainbow Angels, Desert Mission Food Bank, The Cinderella Affair and Native American Connections. For Sunnyslope Elementary School, the group purchased a music cart for $400 to make it easier and safer to transport musical instruments into the cafeteria for practice sessions. Members of the North Central Women’s League got together to sew covers for IV stands for pediatric patients at Phoenix Children’s Hospital—one of many nonprofits the group worked with in its inaugural year. 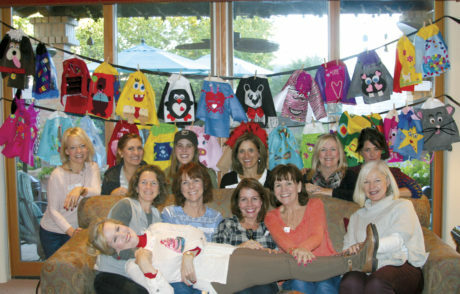 Participants included, from left: front row, Randie Stein, Michelle Rosenbaum, Carol Regan, Tammy Sommerville, Kelly Jackson, and lying across, Jan Byrd; back row, Carla Curry, Kay Tramutolo, aAnna Tramutolo, Jen McKee, Wendy Charles and Jane Dolan (submitted photo). The women also contributed money to the Arizona Humane Society, Camp With a Ramp and Power of the Purse. Plus, they gave $1,500 in scholarships to two Sunnyslope High School students. Friedman explains that the group formed to have a structured way to give back to the community. Currently there are 42 members and a membership drive will take place in the spring. The group has a cap of 55 members. Board members include Friedman, Wendy Charles, Kelly Jackson, Mary Hanss and Tammy Sommerville. Each of the nonprofit’s members pledges to volunteer a minimum of 10 hours a year, September through May, attend meetings and pay yearly dues of $135. “They do get a T-shirt,” Friedman says with a laugh. This year the group hopes to fund two or three “Make a Difference” projects for the North Central Phoenix community. There are plans to purchase an ash tree to plant along the Murphy Bridle Path, and members will volunteer at the Madison Senior Center. Friedman schedules each volunteer opportunity on an online calendar and members can sign up for ones that fit their schedule. Typically each volunteer event lasts two to three hours. “We are so lucky we have the time and the money to do this,” says Friedman. The North Central Women’s League is looking for businesses in the community to partner with to increase their involvement. “Realize by giving us the money, we are doing the work,” she points out. To learn more about how your business can get involved, contact the group via e-mail at northcentralwomensleague@gmail.com, or by phone. Friedman can be reached at 602-432-6682. Wendy Charles, president, is available at 602-430-8686. To learn more about the group, visit www.northcentralwomensleague.org or follow them on Facebook.